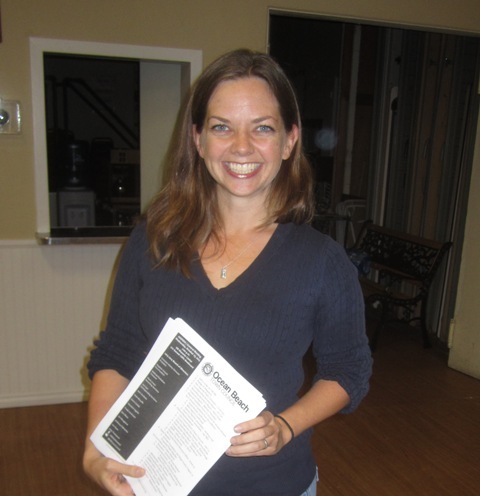 Gretchen Newsom at a recent OB Town Council meeting. Photo by Frank Gormlie. Editor: Our friend, Gretchen Newsom, president of the OB Town Council, announced over the weekend that she is running for San Diego’s mayor in 2016. The following is her press statement about that candidacy. Will make San Diego a place where people thrive not just survive. OCTOBER 25, 2015 – Today at the San Diego County Democratic Convention, Gretchen Newsom, a community leader and advocate for working families announced that she will run for Mayor of San Diego in 2016. Following her announcement, Newsom released her five priorities to Raise San Diego. Local government should respond to the needs of our communities. Our community groups are laboratories for finding solutions to improve our neighborhoods, but they aren’t being heard by the current mayor. For example, instead of celebrating street benches built by community members, the mayor is ripping them out. To make our city government more responsive, I propose creating a meaningful role for town councils and neighborhood groups to inform city decisions and ensure that city actions provide solutions that we want and that we need. We need a city that is affordable for everyone. If you work here, you should be able to live here. If you make a career here, you should be able to retire here. That is why I support the creation of more affordable housing and raising the minimum wage. The current mayor opposes an increase to the minimum wage and opposes providing earned sick days that allow hard working people to take care of themselves and their families. Our economy doesn’t work unless it supports everyone who lives here, and San Diegans deserve a mayor who supports them. San Diego’s economy is driven by innovation. We can lead the nation as a hub of innovation if we prioritize investments in training people. Unfortunately, that is not a priority for the current mayor who is instead focusing on corporate interests. To become a world-class city, I propose we prepare our young people to be successful in the 21st century and drive the innovation economy. By training our own to become the best and the brightest, we will also attract the talent and investments to expand our innovation economy. San Diego is positioned to be a global leader in addressing climate change and sustainability. Coastal San Diego is living the reality of climate change everyday and we know we can’t wait. What we do here can and should set a national example. The water hasn’t risen to the mayor’s office on the 11th floor of City Hall, but it’s rising in our communities. Businesses in Ocean Beach are piling sandbags higher every year. That is why I have been active in finding solutions and propose the city develop an infrastructure plan that protects our natural resources, provides for water independence, and prepares for extreme weather conditions from droughts to floods. For too long, downtown politics have drowned out the voices of our communities. It will take all of our residents to build a better San Diego. We need to empower and uplift all communities to ensure everyone has a voice in the solutions that will transform our city. Participation in our democracy is one way that people can have a stake in the decisions that affect their everyday lives. I propose a city government that is transparent and seeks the input of residents on all major decisions. Make San Diego a place where people thrive, not just survive. GO GRETCHEN!!! Not surprised… Mayor Gretchen Newsom has an excellent ring to it!! Dear Readers: is anyone having problems making comments to any of our articles? Answers to those questions will help many decide to support or not support you. At least the unions are putting up an actual union boss verses just throwing money away behind some tool who will do their bidding while pretending he/she is representing the workers of the region, 90% of whom are union-free. Your first paragraph sounds like Faulconer and the real estate and developers that control him. I’ve worked on both sides and to paraphrase an old saying, I’ve been union and I’ve been non-union. I like union better. It is good to hear that Gretchen Newsom has committed to a campaign for mayor. It is even better to hear a candidate say she is committed to protecting local neighborhoods and heeding the advice of local planning groups. We desperately need a mayor who will actually put “neighborhoods first” (the current mayor’s earlier campaign slogan). At the top of that community commitment for Ms. Newsom should be a resolve to enforce the current San Diego Municipal Code that bars short-term vacation rentals from residential zones. These commercial mini-hotels have proliferated across the city under Mayor Faulconer’s watch. Airbnb alone in June had 2,280 absentee-owner, commercial mini-hotels operating in San Diego’s residential areas. These commercial enterprises rip the heart out of our communities and have made life miserable for thousands of impacted residents just trying to live their lives in peace. Ms. Newsom: Go win this race, then enforce the Municipal Code and deliver the promises the city made to its residents when they bought their homes based on the City’s zoning laws. True, but with the doubling then tripling of flights at 1200′ to 2200′ over our heads on just the first pass over the Peninsula, what kind of neighborhood remains? It’s about the noise, its about the health, it’s about the safety of the community. It’s also about a marginalized economic engine for the entire region. A small single runway airport buried in the “bowl” of a small, economically stagnant downtown is not realistic over the next 5, 10, 20 years – rather, this otherwise nice, little airport needs to be centralized in the region. Who’ll take on that issue with the force and competence necessary? That was, Hear, hear! to Tom Coats comment. San Diegans have a funny way of supporting underdogs who happen to be women: Maureen O’Connor in the 70s, first for council then for Mayor; Donna Frye in a aimilar path (except the mayor’s seat was stolen by the “bubble ballot”); and my own Assembly race in 2004, when I was outspent by $1 million yet won over “mainstream” candidates. So with a good field campaign, true grassroots organizing, strong neighborhood support, hard work and a fair sprinkling of luck,who knows…stranger things have happened. The back story, supposedly, is that Gretchen is trying to force more-well-known Dems to join the race for San Diego mayor. But they’re more interested in taking on smaller contests with less risks. Chris Kehoe, Toni Atkins, Lorena Gonzalez, Lori Saldana, Ed Harris, David Alvarez – where are you? 7 months to the primary in June is plenty of time. Not that Gretchen is worthy, but she just is not that well-known around this town. I can’t speak for the others you mention, but FWIW, I’m teaching for the San Diego Community College district- something I’ve done for decades, beginning prior to serving in the Assembly. I’m also in the process of buying the home I grew up in, located in Clairemont, while still adjusting to life without my father, who passed away earlier this year, after 87 interesting years. People encouraged me to consider the mayor’s race over the summer, but as another candidate who recently lost a family member has attested: you need to put your whole heart into a campaign, and that’s tough while still grieving. Also, I’m now registered as a “decline to state” voter, having tired of the party infighting that resulted in me never being endorsed as a democrat, both when running for Assembly in 2004, and for Congress in 2012. That said: I agree Gretchen could benefit from having others join her. The challenge is finding a good mix of other candidates, who will not only bring out progressives of any registration, but may encourage moderates who are tired of Faulconer’s courting the (soon to be departed) Chargers, etc. With enough people pressing him, it could be a good campaign of ideas aired in lively debates. Otherwise, we are doomed to hear the same old story: silence, interrupted by intermittent attempts to deny, delay, and deceive. Hmmm, Lori – sounds like you could be persuaded, yes? Thanks Frank, don’t really have the heart for a campaign right now. Dear Reader: sorry about the 2 same photos of Gretchen but they were posted at different times and just coincidentally used the exact same great shot of her. She’s a bit too PC and Bandwagonish with her pandering to minimum wage hikes portending to support San Diegans as though she could have any control over actual retirement in San Diego, nor to her under-educated statements about global warming being man made. That being said she is a capable woman who might just ripen to find herself in a reality that isn’t all that media sound-bite and PC pandering that she currently embraces. Hmmm, sounds like she may evolve into a thinking politician. Sorry, that is an oxymoron. Best of luck but electing her because she is a woman is a lousy excuse for voting. She needs to get real, get smart, and stop pretending to be what the voters want and be what she knows she SHOULD be. And yes, they are mutually exclusive. Maybe you should ripen yourself to reality. 200 scientific organizations agree that global warming is real and being caused by man. here’s the confusion on the of the part man-induced global warming nay-sayers. their argument is that global temperature more or less fluctuates sinusoidally. this is fairly correct, but if you look at the slope of a line fit to the sinusoidal fluctuation, you’ll see that the slope of the line is positive (still sinusoidal, somewhat, but with the lows and high increasing). the increase in slope is correlated with increased carbon emissions. so… people have got to look at the whole package. I wish that I lived in San Diego just so I could vote for Gretchen Newsom. I predict that one day she will become Governor of California. She is going to be the best mayor in San Diego history. You are so lucky to have a candidate like Gretchen. Regarding affordable housing, while great in theory, it’s difficult in practice. With land costs through the roof and rents necessarily capped, developers often find little incentive to jump in the market. NOI’s aren’t going to attract investors. Tax incentives have to be exceedingly generous for developers to even consider moving dirt for affordable housing. Inland Empire, sure. Rents are already low and land is affordable and entitlements are handed out like candy. Here? A bit tougher and the entitlement process considerably more challenging.